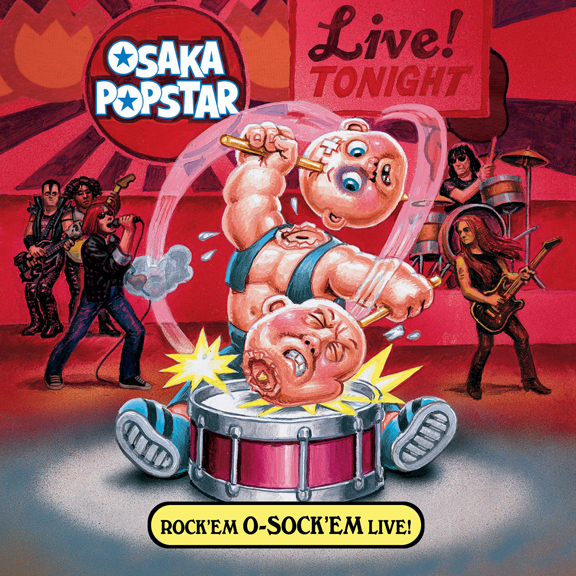 Osaka Popstar returns with “Rock’Em O-Sock’Em Live!” Recorded on Halloween Night at the Starland Ballroom in NJ, the all-new CD features 9 tracks including favorites from the critically acclaimed debut album PERFORMED LIVE along with Osaka Popstar performances of 3 Ramones classics! 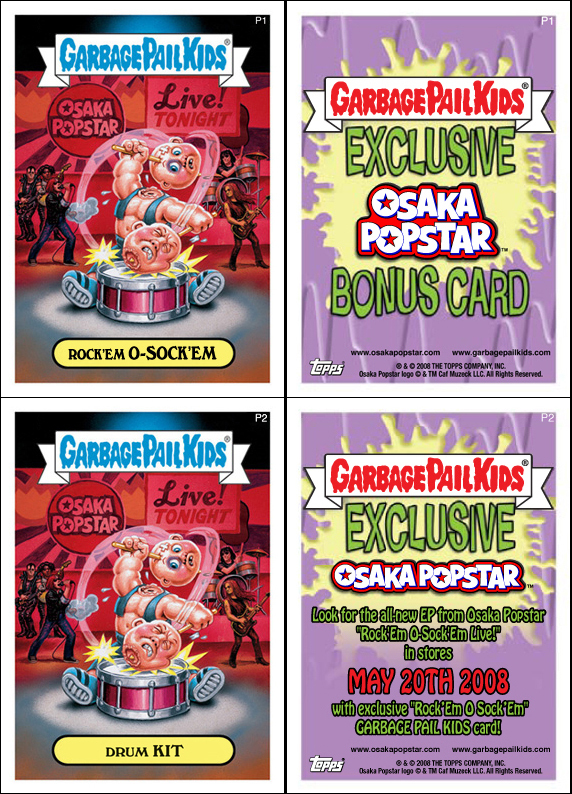 With rich cover art straight from Topps’ Garbage Pail Kids All-new Series 7; each Limited Edition Digipak includes a FREE exclusive Topps Osaka Popstar-Garbage Pail Kids Trading Card inside! Look for Osaka Popstar’s “Rock’Em O-Sock’Em Live!” Ltd Ed CD Digipak in stores and online, also available at iTunes and digital music providers worldwide. The rich artwork, straight from Topps’ Garbage Pail Kids All-new Series 7, also graced the cover of the “Rock ‘Em O-Sock ‘Em Live!” CD. The cover, (painted by John Pound) was named #2 on Smashing Magazine’s 100 obscure and remarkable CD covers alongside the legendary Beatles “Sgt Pepper’s Lonely Hearts Club Band”, Pink Floyd’s “Dark Side of the Moon” and modern day classics like Green Day’s “21st Century Breakdown” artwork by world-renowned UK graffiti artist Banksy. Each Limited Edition CD digipak includes an exclusive Osaka Popstar-Garbage Pail Kids Trading Card inside. Not a sticker, but an authentic GPK trading card from the Topps Company themselves. In addition to the trading card, a variant version of the artwork is printed full panel inside the digipak and also available as a T-shirt. The OP-GPK bonus card inside each Ltd. Ed. digipak was numbered by the Topps Company “P1” (promo 1) with the character name “Rock’Em O-Sock’Em”. True to traditional GPK series releases, an alternate “b” version of the trading card numbered “P2” (with the character name “Drum Kit”) was available as a free giveaway from Topps at New York Comic Con April 18-20, 2008. In its initial 2008 release, all orders for the “Rock’Em O-Sock’Em Live!” CD placed at the Misfits Records and Osaka Popstar online stores received a FREE P2 OP-GPK “Drum Kit” bonus card personally autographed by Osaka Popstar frontman John Cafiero.